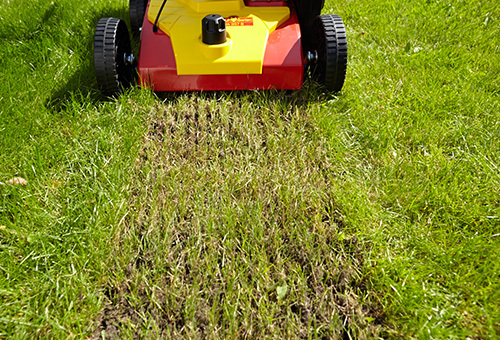 Experienced lawn enthusiasts swear by the cleaning action of scarification. There is no better way to get rid of thatch from the remnants of dead plants and grass cuttings as well as moss and shallow-rooted weeds. 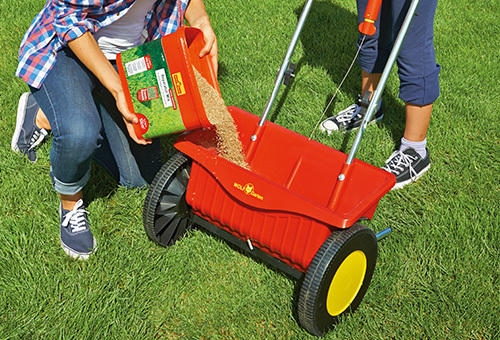 A rotating roller cuts into the soil at the surfaces to loosen up thatch, moss and weed roots, the dead organic material is either collected in the catch basket or removed subsequently from the surface of the lawn using a rake so that the grass gets air to breathe and water to grow. After the scarification it is best to feed the lawn with nutrients so that it can recover. Your lawn should be able to regenerate before the scarification. For that reason, when it starts to flower outside, scatter a high-quality lawn fertiliser so that the hungry grass that had been stressed by the winter can grow more strongly. When the mowing season starts, mow your lawn two or three times before scarifying it for the first time. Now scarify the lawn thoroughly - ideally several times - across both the length and the width. Always ensure that the blades only touch the ground lightly so as not to cut it up. Scarifying too deeply damages the grass roots and wears the blades of the scarifier. For that reason always pull quickly across the area. After treating the whole lawn you can make minor corrections to the surface of the soil by adding or removing topsoil where it is needed. Small gaps caused by the scarification will close up by themselves.